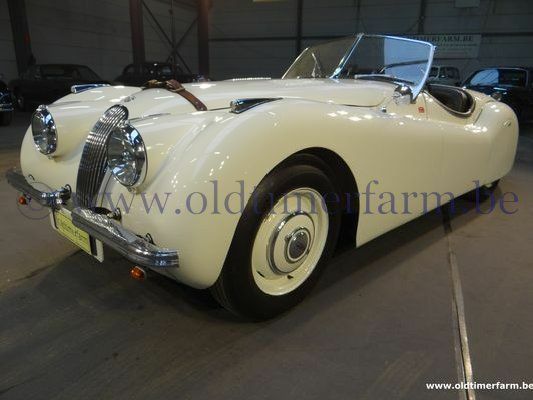 (from Wikipedia, the free encyclopedia) The XK120 was launched in roadster form at the 1948 London Motor Show as a testbed and show car for the new Jaguar XK engine. It caused a sensation, which persuaded Jaguar founder and design boss William Lyons to put it into production. 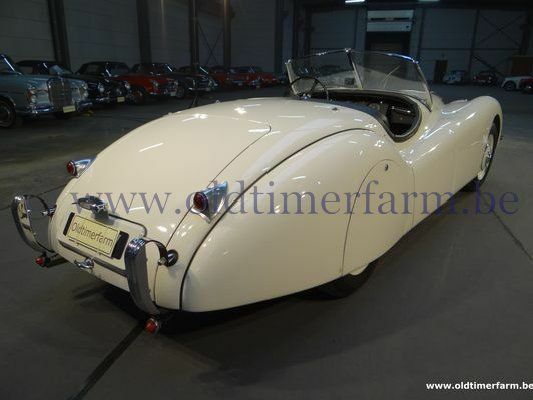 The "120" in its name referred to its 120 mph (193 km/h) top speed (faster with the windscreen removed), which made the XK120 the world's fastest standard production car at the time of its launch. It was available in two open versions, first as the roadster (designated OTS, for open two-seater, in America), then also as a drophead coupé (DHC) from 1953 – and also as a closed, or "fixed-head" coupé (FHC) from 1951. The DHC was a more deluxe open model, with wind-up windows, and wood-veneer dashboard and interior door caps, as on the FHC. The roadster was successful in racing. Bodywork. Length/width/height/wheelbase – cm (in) : 442/159/135/234 (174/61.4/53.2/102); weight : 1320 kg (2913 lb). Engine. Inline 6 cylinders 3442 cc (210 ci), front-mounted, 12 valves, 2 SU carburettors, manual 4-speed gearbox, rear-wheel drive. Maximum power : 162 bhp @ 5000 rpm; torque : 310 Nm @ 2500 rpm. Top speed : 193 km/h (120 mph); 0 – 60 mph in 11.1 sec.